The Nation thought the Electoral College “might very profitably be dispensed with,” to avoid a repeat of the election debacle. 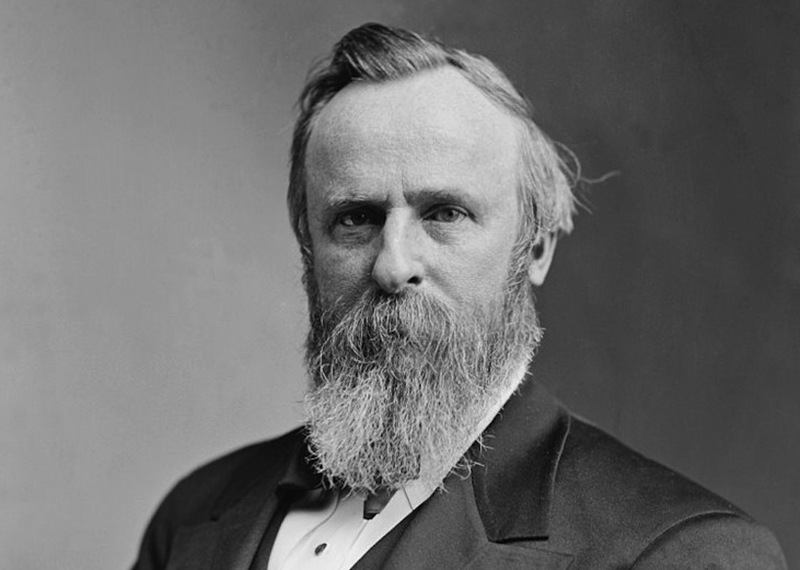 Rutherford B. Hayes. Photo via Library of Congress. The results of the presidential election of 1877 were up in the air until well after the New Year, which partisans of both the Democratic candidate, Samuel Tilden, and the Republican, Rutherford B. Hayes, plausibly claiming to have evidence of widespread tinkering with ballot boxes on the part of the other candidate. A committee of fifteen eminences was constituted to sort it out, and eventually the eight Republicans on the committee outvoted the seven Democrats and awarded the election to Hayes. The Democratic Congress, however, only accepted those results—on this day in 1877—once Hayes promised to withdraw federal troops from the South, thus ending Reconstruction. In an editorial titled “The Provision for Future Presidential Disputes,” The Nation warned that the Electoral College was largely responsible for the dysfunctional process, and that keeping it would only lead to a repeat of the electoral spat that had implicated the Supreme Court in the overturning of the democratic will (five Supreme Court justices sat on the committee). One hundred thirty-three years later, The Nation’s fears, sadly, were vindicated. Now that the Presidential controversy is over, it is none too soon to think of the means to be adopted to prevent any recurrence of the great danger through which we have just passed. The crisis has brought home to us in a most impressive way the fact that the Presidency has become so huge an affair that our own judicial resources will not enable us to dispute over it without great peril. It is, in other words, so great a prize that it would be almost impossible for us, probably before very long would become wholly impossible, to erect judging machinery strong and steadfast enough to try the title to it…. The settlement has been made with some damage to the Supreme Court—not grave damage, perhaps, but grave enough to make it clear that we could not safely resort to it again in a like case…. Under [one reform proposal], the electors might very profitably be dispensed with. At present they serve no useful purpose, and they furnish, as have recently seen, an occasion of much sin and sorrow. They can do no good in the existing or any profitable state of public opinion which might not be done by a well-contrived machine, while they exert, and will hereafter exert more than ever, an exciting influence on the guilty and restless spirits of Benedict Arnold and Judas Iscariot.